Users can access notification preferences from the notification panel. Currently users can control which extensions they get notifications from and which channels to be used (web and/or email), but that only affects local notifications. When notifications from other wikis are surfaced in the notifications panel, we need to decide how much control users have on which ones get shown there. Control level. How much control do users need to show/hide external notifications. No control. External notifications are always displayed (users may control individual extensions in each wiki as they do now). Overall disablement. Users can chose whether to display external notifications or not. Filter by origin. Users can chose the visibility of notifications based on the wiki (or project/language). End to configure. Where are notifications configured from. Control the current project visibility elsewhere. That is, if I'm in Commons I can control whether notifications from Commons are visible elsewhere. Control other projects visibility in the local project. That is, if I'm on Commons I can control whether notifications from other projects (e.g., Wikipedia) are visible on Commons. A user participates on English, French and Breton Wikipedia as well as Commons and Wikidata. When the user is on Wikipedia (in any language), the user is only interested in getting notifications from Wikipedias (in any language) but not from other projects such as Commons or Wikidata. A user participates on Commons, and three Wikipedias (English, German and Dutch). While on a specific wikipedia the user wants to focus on those notifications from the local wiki (not from other languages to avoid too many distractions) but the user also wants to get Commons notifications since they are volume and otherwise they can be missed since the user does not visit Commons regularly. For example, below I illustrated a possible solution where users can control the visibility of other projects facilitating the selection of all and nothing, but also allowing a specific list of projects. That is just a possibility, and depending on which scenarios are more common a different approach would be preferred. In the initial iterations for cross-wiki support, the beta feature mechanism (T114237) will act as a general switch that users can use to control whether (all) cross-wiki notifications are shown (everywhere). Based on that initial solution, we'll get a better understanding on the different scenarios and the degree of control we need to provide. Pginer-WMF added subscribers: Aklapper, Pginer-WMF. I know I'm posting something useless, but we really need T114917: User preferences for cross-wiki notifications... That kind of feature would have given to user a way to choose where he want cross-wiki features notices to be displayed. Why do you say your comment is useless? Has this feature been discussed and rejected by the team? Do have any information about this -- i.e., have you heard from people, etc.? Or are you judging from your own experience? We (as WMF) don't have plans to have real centralized preferences at the moment, which should have been a good way to solve our problem. Mention that task was not that useful: we are not going to wait that centralized feature to deploy cross-wiki notifications, but it may be a very good next step "Useless" may have not been the best choice to describe my feelings. I've read and heard people saying (paraphrasing) "cross-wiki notifications are cool, that the first step to have a full centralized watchlist/preferences/talk pages". I can give you some links. For the initial steps, the beta feature settings can be used to control where to have cross-wiki notifications visible. Based on how people use this, we can get a better idea about the specific degree of control needed. Most of my notifications come from the English Wikipedia. This is not surprising, since I spend a lot of time there. When I go to other projects (except maybe Meta or mediawiki.org), I don't really want to see a note that tries to drag me back to the English Wikipedia. But I really *need* the notifications from the other projects, because I don't visit the Hebrew Wikisource or the Catalan Wikipedia all that often (to name just two that are currently in my list). So what I'd like is a system that says, "Tell me about enwiki notifications only when I'm at enwiki; tell me about everything else everywhere." The net result is that I'll see a cawiki notification when I'm at enwiki (and all other wikis), but I won't see an enwiki notification when I'm at cawiki (and I will see notifications from all the other wikis there, too). which says "Show notifications from this wiki, at all other Wikimedia wikis". Would like to be able to change a preference on a project to include (Default) or not include "this project's notifications" to the central notification. 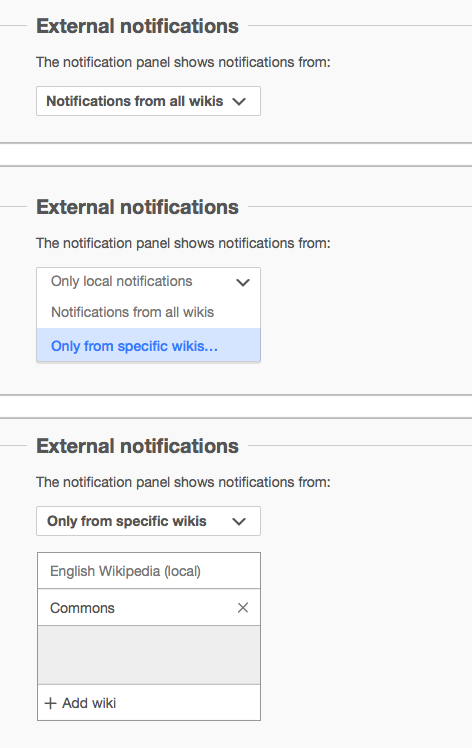 Recent discussion on enwiki was from an editor that liked central notifications in general, but for example did not want central notifications from wikidata.